Download a brochure here. See the NOSAS Blog Post or access the 2012/13 report. “Thee Ferintosh! O sadly lost! Over the years oral tradition has had it that there are the remains of a distillery dating back to the 18th Century at Mulchaich Farm, located in the district of Ferintosh on the Black Isle. The distillery site is about 200m NW of the farm and was previously unrecorded; it was in a sorry state being quite overgrown with whins and with the few open areas grossly trampled by cattle. 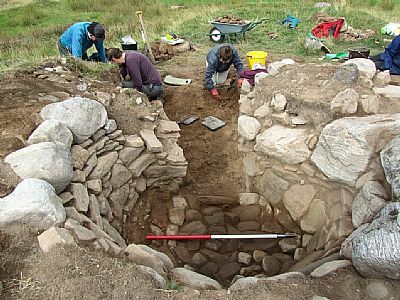 In 2009 members of the North of Scotland Archaeological Society began a project which had as one of its aims the surveying and recording of the distillery site and that of the neighbouring chambered cairn. The project also included a limited amount of historical documentary research and took place between February 2009 and May 2010 - see the report. The oral tradition of the site being a distillery is widely held both by local people and by the former landowner who himself is a direct descendent of Forbes of Culloden. 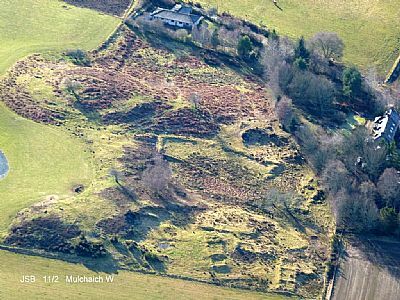 We have found no firm evidence of the distillery site being used to produce whisky however and there is no firm documentary evidence linking Mulchaich with the production of Ferintosh whisky. But there are lots of tantalising features about the site which lead us to believe that distilling was carried out on an industrial scale and there are vague references in documents to barley being imported to Mulchaich. Of these more is described later. It was felt that together with the chambered cairn the site would make an interesting and attractive place for people to visit. The landowners, the Dalgetty family, were happy to oblige with permission and for this we are very grateful. In addition the Adopt-a-Monument Scheme hosted by Archaeology Scotland, were keen to help us with advice and limited funding, so in October 2012 we set about preparing the site for public presentation and fencing it (be aware though that the site is still rough and there are many trip hazards). See here for details of this previous NOSAS work. We also produced explanatory leaflets and carried out a small excavation of the kiln with the aim of showing its features off so that the process of drying malt could be explained. Mulchaich is situated on a NW facing slope of extensively farmed agricultural land above the Cromarty Firth in the western part of the Black Isle. It has panoramic views towards Dingwall and Ben Wyvis. The site is just 2 miles NE of Conon Bridge and approached by minor roads between Easter Kinkell and Alcaig, east of Conon Bridge. It is close to the Ferintosh Free Church at grid reference, NH 576 568. Parking is in the Ferintosh Free Church car park, however we request that you avoid Sunday mornings and evenings when the car park gets very busy. From the car park there is a 300m walk - go north and take a right turn, signposted “Mulchaich”. The entrance to the site is the second gate on the left. Please do not park in this entrance. Please keep dogs on leads on the site as the enclosure is used for grazing sheep. The ingredients required for making whisky are grain, usually barley (or in earlier days bere, an ancient form of barley), a constant supply of running water and a plentiful supply of peat. The barley is allowed to germinate into malt which is then dried by gently heating it. The dried malt is milled to make “grist”, and this is then mixed with hot water to make “wort”. The “wort” is fermented and the resulting “wash” is heated up in a still, preferably made of copper. The alcohol vapours given off are cooled by passing them through a “worm” which has cold water running over it and the spirit is collected from a spout at the bottom of the “worm”. For more information on production of modern whisky click here or visit Dallas Dhu distillery which is in the care of Historic Scotland, click here. 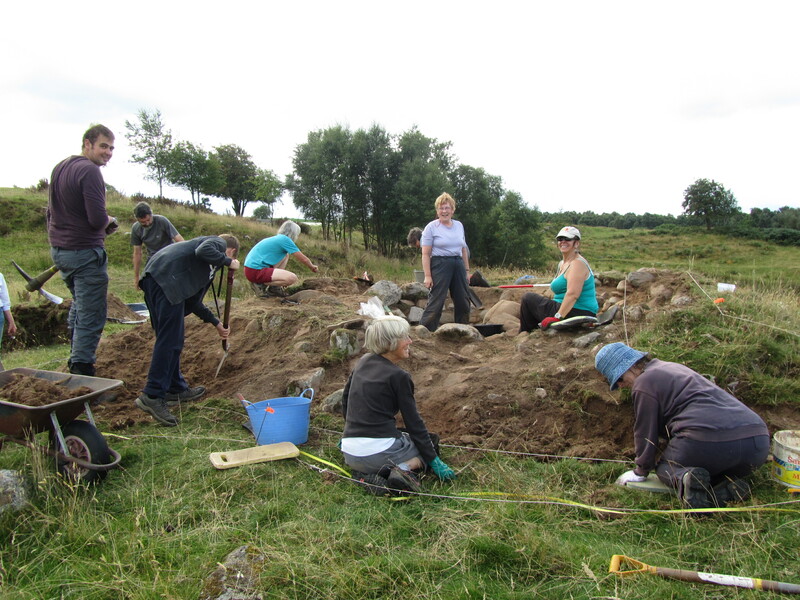 Initially the site was quite overgrown and the first task of NOSAS members was to clear the whins and vegetation so that a better look at the features could be achieved. We were then able to survey the site using a combination of plane table and taped offset methods. This plan was the result of our survey. The marshy area at the centre of the site and its spring fed well would have been a pond which provided the water essential to the distilling process; the drainage of the area has been significantly altered by more recent field drains, the pond is now silted up and appears as a bog. The central part of the bog has a firm base and systematic probing of it indicates that there are the remains of an embankment in its lower part. 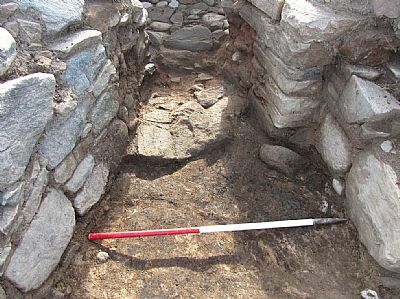 A kiln with a barn of two compartments is located in the north part of the site; here the barley or bere, which had been allowed to germinate, would have been made into malt by gently heating it until it was dry. Outwardly the building has the charecteristics of a corn-drying kiln and it is well documented that corn drying kilns were used for malting in the early days. Corn drying kilns, as is evident from the name, were normally used for drying corn and were an essential part of all Highland townships where the climate could not be relied upon to dry the corn sufficiently for it to be ground into flour or meal. The grain would have been laid out on a grid or perforated floor on top of the kiln bowl, warm air provided by a fire on the outside (but inside the kiln barn) and ducted by a small flue into the bowl, was drawn up through the grain thus drying it. 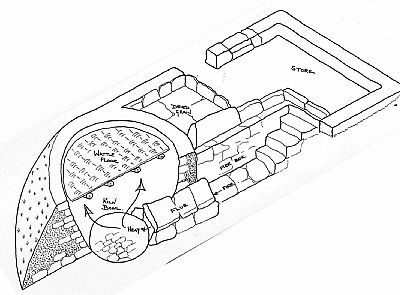 The sketches are of a corn drying kiln in Glen Banchor, near Newtonmore, which was excavated and reconstructed at the Highland Folk Museum, Newtonmore. In the 18th century malt kilns as we know them in modern distilleries had not been developed. When we excavated the kiln bowl at Mulchaich it proved to have an unusual flue. The flue was substantially constructed and was much wider and bigger than was normal for a corn drying kiln; in addition the fire platform was inside the flue and much nearer to the kiln bowl itself; there was an interesting stone arrangement which would have directed the warm air up through the kiln. Was this a transitional form of malt kiln? 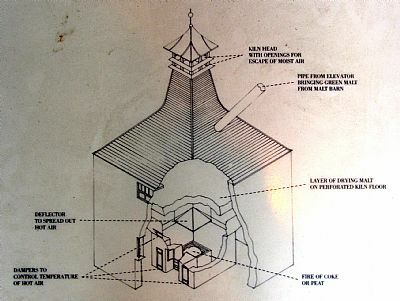 Later malt kilns had the fire, with a heat deflector above, directly under the malting floor and the floor was much higher, presumably to reduce the risk of the whole lot catching fire - see sketch. Together with the oral tradition of this site being used to distil whisky the archaeological features are pretty convincing. “At Cromarty 28 March 1733 Alexander Mackenzie in Mulchaich in Ferrintosh, Robert Mackenzie there, Donald Fowler there, and Colin Simson in Cromarty (of whom only Robert could sign) ‘signed’ a bill that they would on 15 May pay Mrs Margaret Mackenzie £128 Scots for “value received in sufficient bear (bere)”. The bill was protested for partial non payment on 8 November”. Almost certainly the bere was being imported to Mulchaich to make whisky. The Roy military map of c1750 has a densely populated area at Ferintosh, click here, with at least 7 large townships. 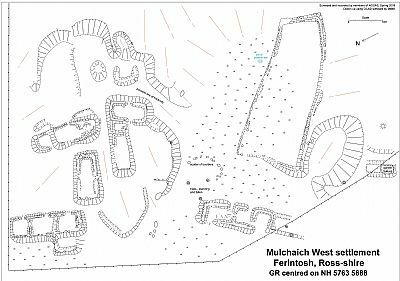 A township at Mulchaich is not mentioned by name but almost certainly the township in the southwest of the group is in the position of Mulchaich. About 400m to the NE of the farm there is another settlement site, see here, which would have been in existence at the time. Scheduled by Historic Scotland and very different to the distillery site it comprises the turf footings of 9 or 10 buildings arranged in two parallel rows – this was an earlier township where a distilling would have been done as a cottage industry in 1750. This township probably continued to provide accommodation for the workers at the distillery site when it was built in the 1760s or in 1782. Interestingly a George III (1813-1819) penny was found between this township and the distillery site during a fieldwalking exercise. The prehistoric chambered cairn, NMRS No NH55NE 0002, is a Scheduled Monument and unusual in that it is encircled by two stone built kerbs. The inner kerb, of larger stones, has a cup marked stone in its south quadrant. 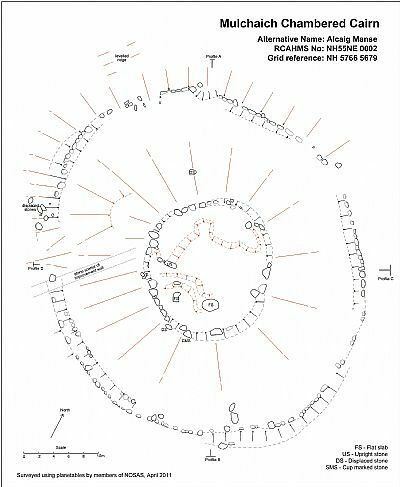 Both the chambered cairn and the stone date to late Neolithic or early Bronze age times (3000 BC to 1500 BC) and are thought to have served ritual purposes. The large flat slab at the centre almost certainly has a chamber underneath it and other disturbances on the summit of the cairn are most likely the work of antiquarian investigators. 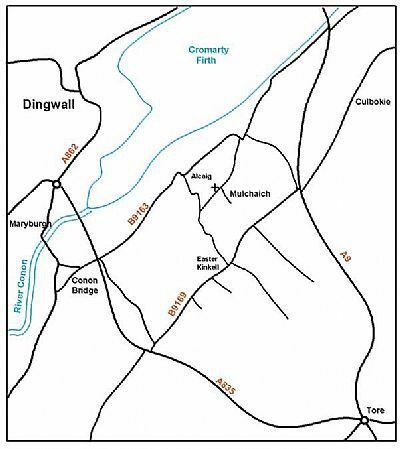 In 1476 the king confirmed the “lands of Estirkynkelle, the mill of Alcok, the two Kinkells, Mulquhaich and Drumvourny” to William, Thane of Cawdor - it was known as Ferintosh. The Gaelic “toiseach” translates as “thaneship” in the language of feudalism. Thus the name “Ferintosh” refers to the “land of the thane” (Watson p114). The extent of Ferintosh is seen on the Thomson map of 1830 where it is marked as “Part of Nairn”. The Forbes of Culloden family supported the Crown throughout the turbulent times of the 1715 and 1745 Jacobite rebellions at great expense to themselves. The 5th Laird of Culloden, Duncan Forbes (1685 – 1747), was an eminent and much respected lawyer, MP for Nairn and Inverness, and from 1737 – 1747 Lord President of the Court of Session in Edinburgh. He made heroic attempts to reconcile the two sides in the Rebellion of 45 but in the end took the side of the government and as a result left his estates heavily in debt on his death in 1747. John Forbes (1710-1772), his son, set about restoring the family fortunes. He married an heiress from Kent and in the 1760s enlarged the distillery at Ferintosh and built 3 more distilleries on his Estate. Production grew dramatically, in 1763 the output of whisky on the estate was 41,200 gallons, in 1770 it was 89,700 and by 1780 it was 123,900 (Moss and Hume, 1981). The population at Ferintosh grew. It was said that around 1,000 people were involved in distilling whisky with few men being left to cultivate the land. The Roy military map of c1750 has a densely populated area at Ferintosh, almost certainly this population were involved in distilling whisky. In 1782 a further large distillery was constructed. This was the last straw for the other distillers who could not compete; there was an outcry and the government withdrew the privilege in 1786. Later, building on the reputation of Forbes of Culloden, many producers in the 19th century sold their whisky under the name of Ferintosh and in 1893, the Ben Wyvis distillery built in 1879 in nearby Dingwall, took the name of Ferintosh, it didn't last long though and closed in 1926.